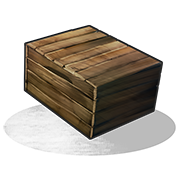 A Wood Storage Box is a small box with the ability to store a maximum of 12 separate items or stacks of items inside of it. These can often times be used as a more space efficient way to store your items than the Large Wood Box, but can prove difficult to keep sorted as not all of your items are in one container. They can have both locks and codelocks placed on them to keep unwanted newmans at bay for a brief period. If destroyed, they will destroy a portion of their contents as well. Boxes can be placed on shelves to save space.